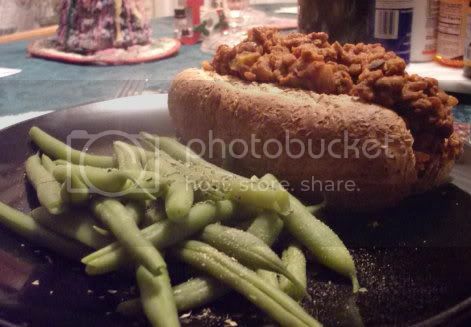 Snobby Joes — Vegan Sloppy Joe Bliss! 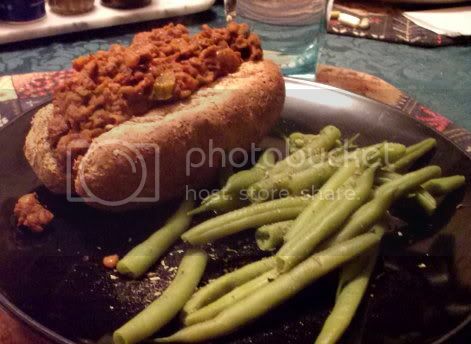 The last time I had a sloppy joe, I was about four years old. They weren’t something that was very common in my house, so I never really had a craving for them. Nonetheless, “Snobby Joes” from Veganomicon was one of the recipes that I’ve had my eye on for ages but only just got around to making. It beats me as to why I waited so long! 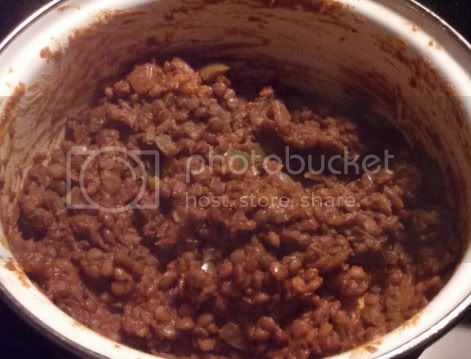 I don’t know if my subconscious aversion to ground beef made me biased or what, but I can’t believe I didn’t pounce on this recipe the instant I obtained a copy of Veganomicon. Even though it takes about 45 minutes total to put together, this is a really easy recipe. The only things that need chopping are peppers and onions. Once the lentils are cooked, it’s mostly a matter of stirring everything together to incorporate the flavors. The most interesting part, to me, was adding maple syrup and mustard at the end. Along with the zing from the chili powder, it gave the whole mixture a unique twist. I couldn’t find any decent hamburger buns, but there were some whole wheat Ezekiel hot dog rolls in the freezer. They worked out rather well…it was much less “sloppy” than it might otherwise have been! Plus it looked pretty neat. The Snobby Joes were hearty enough that all the meal needed to be complete was a veggie, so I pulled some of our garden-grown green beans out of the freezer and dusted them with a little garlic powder and Italian seasoning. So. Good. This is the sort of thing that I could eat pretty much constantly and not get sick of. NICE! I have made them with TVP before but this sounds even better!